We have lots of eggs. So many that we ourselves are astonished. As we approach the days with the least amount of daylight there are usually no eggs. Or very few. They are a couple flocks that started laying just in the past few weeks. Those flocks arrived as day old peepers last spring, and are just now mature enough to lay. We anticipated that these girls would be producing now. What is surprising is that the rest of the flock, including hens that are 4, 5 and 6 years old, are also producing eggs. The pen design has evolved over the years. The very first egg layer mobile pen is still on the farm, but really serves as the infirmary. It is really difficult to move and strains your back and legs. 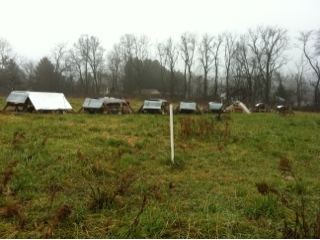 The egg layer flotilla, now, is a total of 9 pens, each with enough protection from the fox, hawk, owl, etc. The pens have shade covering and plenty of really solid roost space. The roost area is completely protected and the hens are close to each other up there. Plenty of room on the ground for scratching, dusting, running, grass consumption. We are delighted to have the eggs. Last winter we had 2 or 3 eggs each day. By the end of October last year we had to stop offering eggs, and had to make up some eggs this year for CSA customers. Not this year! And we are loving it!